Though hardly a household name here in the States, Coste Apetrea is quite well-known in the Scandinavian region. This Swedish guitar virtuoso's career spans more than three decades of involvement in many types of music, mostly avant garde and progressive. Apetrea's music has been expressed through many vehicles including several bands like the legendary prog band Samla Mamma Manna and work with another with another distinguished Scandinavian guitarist, Jukka Tolonen. Additionally, Coste has seen action in composing and producing for many media outlets including film, radio, and television. For the most part, on 'Surprisingly Heavy,' Apetrea has accomplished his goal. Although I would say that there is nothing on this work remotely like progressive metal, Apetrea does present some very heavy riffs with some blistering guitar work that could easily be found on any prog metal work. Much of this is braced by his continued integration of jazz and rock fusion into the music, though the jazz element is much more suppressed. Numbers like 'Kolkata Traffic,' 'Mental Oil,' and the title track are representative of this direction. However, 'Shadow Boxer' finds Apetrea's stinging quasi metal fret work juxtaposed again some definite and more sublime rock fusion. With its diversity and ingenuity, Coste Apetrea's 'Surprisingly Heavy' is a surprisingly entertaining and masterful piece of progressive rock. Many will find the songs challenging (as prog rock should be) because of their natural complexity, but this should not hinder anyone from opening wide the windows of creative musical expression. Very recommended! 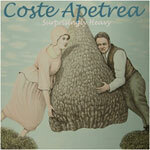 With its diversity and ingenuity, Coste Apetrea's 'Surprisingly Heavy' is a surprisingly entertaining and masterful piece of progressive rock.